If you're like us, you love to share your roses with other rose aficionados. 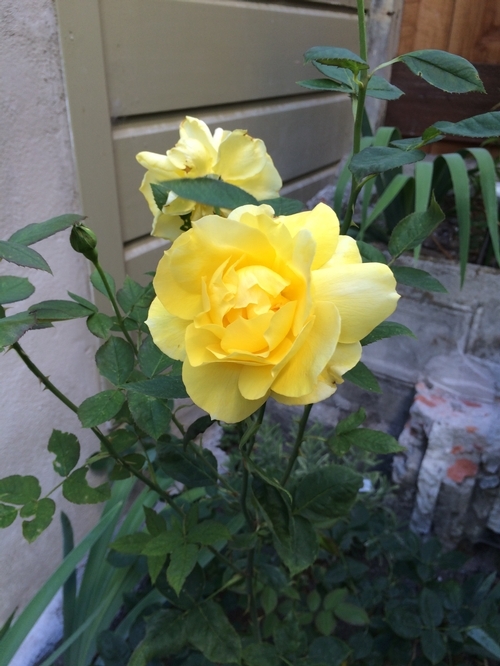 With the help of the Internet, you can now show off your rose or rose garden on our site. To get started, click on the camera at the right. Uploading your image is as easy as attaching a file to an e-mail. We look forward to you contributing to our virtual global garden tour. Thank You for the lovely pictures!! To enjoy other photos, click on a thumbnail and the corresponding image will display. Simply click on the thumbnail of your favorite Customer Rose Gallery photo for an enlarged view. Mellow Yellow has huge deep yellow blooms that lighten over time, with a wonderful fragrance. Its one disadvantage is the fact that the blooms are so large that the canes can't hold them up without support -- this is definitely a rose to cut and enjoy in the vase.